Startups.in was sold for €125 Euros. Interesting site, startups.in. Based on Pligg by the looks of it and seems really active now. Anyway - its been added to the list. Thanks very much for the comprehensive list. This really helps refine value analysis. I have sold a few 0nn.in. Anyone else selling any nnn.in? VIN.IN sold on Sedo auction for $610. Thanks - I saw this too. I know from experience that not all Sedo sales go through so was reluctant to post it until it appeared on the Sedo frontpage. Happy to see it went through and I've added it to the list. Theres an increasing number of LLL.in among those high sales. Linkshare.in wow! Nice! Go .in! Thanks, Frank - I added that. I saw that one - WAP.co.in - underpriced I think! This fantastic domain name got sold for U.S.6666 Dollars, in september 2006 at e-bay.com. This news was broken by CNBC AWAAZ in India. Lucky seller as well as buyer. Great sale, but I think Steve is only listing India domain name extensions here (.in, .co.in , etc.). Can you clarify, Steve? Yes - worth starting a separate list for .coms / nets that have an Indian connection? Plus, one for Indian IDNs as well? 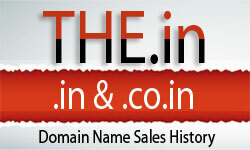 It would be very useful if there is a separate thread for .com domains owned by Indian's.